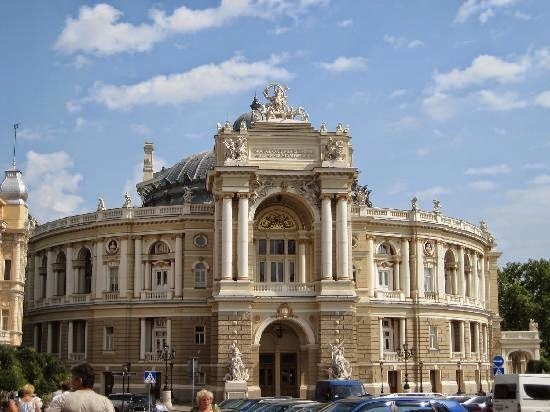 Odessa, the third largest city of Ukraine offers much to delight the culture hungry tourist. This is a city steeped in history and one that you can wander around endlessly discovering interesting sites or just gaze at the old 19th century limestone houses. It is beautiful, wide tree-lined avenues and huge parks will keep you entertained for days as will ambling down its busy pedestrian walkways like Primorsky Boulevard and Deribasovskaya Street.It was once known as the Russian Riviera, the city is now dubbed as the Pearl of the Black Sea and a short trip here is sure to explain why. The most amazing thing about Odessa is you can reach here in a variety of ways.. There are regular buses and trains from Varna and Bourgas as well as flights from Varna and Sofia and there are plenty of local trains and buses linking the airport with the city. If you wish to drive you need to head towards Varna then up to the Romanian border at Durankalak then on up the Romanian coast into Ukraine. Probably the best way to get there is by ferryboat. Odessa has one of the largest ports on the Black Sea and ferries run from Varna throughout the summer, between Mondays and Saturdays. The adult fare costs around 150 Euros for a round trip in an economy cabin and only 200 Euros for an upgrade business class. This journey takes approximately nine hours but there are plenty of things on board to keep you busy.There are frequent buses and trolleys linking the port with the centre. Tram, trolley and bus are the most popular modes of transport in the city. Travelling round the city by car is not so easy cause there are very few street signs. Originally it an ancient Greek colony, Odessa was ruled by many Empires throughout the Middle Ages; it fell into Ottoman hands and was later liberated by the Russians at the end of the 18th century. The Russians took over the city establishing a naval fortress here and it was then known as Odessa. The new city grew in prosperity thanks to Duc de Richelieu who became it's governor. By 1819 the city was declared a free port and cause of the large number of foreign ships sailing here its population consisted of many different nationalities. One of its most famous inhabitants was the renowned Russian poet Alexander Pushkin who lived in exile here. During the Crimean War between 1853 and 1856, odessa was attacked by the French and British navies, but soon recovered and became Russia's largest grain-exporting port. In 1905 Odessa was home to a major uprising, that was supported crewmembers from the Russian battleship Potemkin and following the Russian revolution in 1917 Odessa came under the occupation of a variety of groups from the White Army to the French Army. In 1920 the Russian Red Army seized power and Ukraine became part of the USSR.During the Sixties and Seventies the city grew in prosperity and became a cosmopolitan centre with a distinct culture. After the fall of the Communist regime in 1991 odessa became the major port of the newly independent Ukraine.Currently odessa has a population of around one million people and is reliant on shipbuilding, oil refining, chemicals, metalworking and food processing. Odessa’s old town is a site to behold with a beautiful opera house and some most attractive parks. It is noticeably clean and extremely safe. The main street leading through the old town is particularly lively with plenty of shops selling handcrafted goods. This city is home to many interesting museums with the Museum of Western and Eastern Art being perhaps the most interesting. The Literature Museum takes visitors through a hundred years of literary works from city authors, whilst the Maritime Museum exhibits an interesting Marine Fleet. There are some great walks in the city, the one from Primorsky Parkway to the city’s most well known site the Potemkin Steps, passes the statue to Duke Rechelieu, one of the city’s founders. The steps are a phenomenal site considered to be the formal entrance into the city from the sea. The steps have been constructed to give the optical illusion of a never-ending staircase. If you are feeling jaded after this walk, don't need to worry; you can take the funicular railway to take you to the top of the steps. Once you have taken in the fantastic views from here you can head back down and on to Catherine Square, aptly named cause of its statue to honour Catherine the Great, another of the city’s founders. The Odessa Catacombs are also well worth visiting. The Catacombs are the result of abandoned limestone mines, that were later used by smugglers. The Catacombs extend under the whole of the city and are one of its biggest attractions. The 19th century Vorontsov's Palace at the end of Primorsky Boulevard consists of the former residence of Prince Mikhail Semyonovich Vronstov,was one of the city’s governor-generals. In 1917 it was used as the headquarters of the Soviet Red Guards. If you love shopping then a trip to the famous Privoz Market on Privoznaya is worth seeing,this is the city’s biggest food market with a history dating back to 1827. Currently virtually everything is sold here from caviar to shoes and clothing and a variety of unusual second hand goods. Away from the busy port, the majority of Odessa’s shoreline is some wonderful beach areas. Lanzheron and Otrada beaches are the closest to the centre. Dolphin beach is home to the city’s dolphinarium. Arcadia beach is the most popular with tourists and contains many good restaurants, bars and nightclubs. Quirky Malibu beach at Luzanovka is the cleanest and has excellent amenities too. Dining out is extremely inexpensive here and you can afford to splash out. There are also plenty of fast food vendors selling a variety of tasty street food and of course numerous McDonald’s chains.The choices of restaurants selling Ukrainian cuisine are abundant and well worth trying, as is the local beer and wine. Odessa also has a vibrant nightlife. There are plenty of hotels around at reasonable prices but on arrival in the city be prepared to be bombarded by locals trying to offer rooms for rent. Such private rooms whilst cheap and clean are not recommended as the bathrooms are usually primitive by Western standards. The St. Paul Church House on Novoselskogo, is a nice place to stay and very reasonably priced at 40 Euros for a double room. If you're looking for real style then try the four star Londonskaya Hotel or the 19th century Krasnaya Hotel. This hotel is built from pale red sandstone in an attractive renaissance and baroque style. So what's your view about Odessa,a beautiful city of Ukrain?Willing to make a trip there in this winter?Share your thought with us. i have never been to odessa but hopefully someday, i will make it there! I would love to visit Ukraine too! The place looks interesting, I can imagine based from your post.